This is a statue honoring George Mason that I discovered whilst wandering in D.C.. 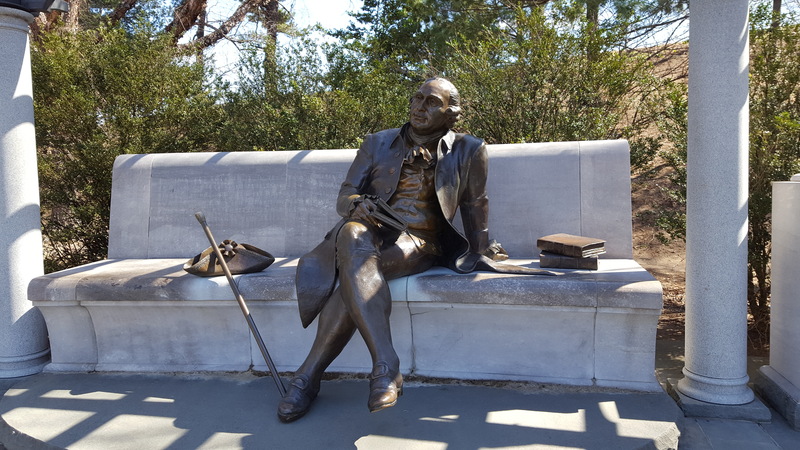 Despite being a lover of history, I had no idea who George Mason was, but I have quoted (or misquoted) him on occasion. So here’s a quick top 10 on the other George..
10. He has a university named after him. George Mason University… obviously. 9. One of the founders of Alexandria, Virginia. 7. George and his wife, Ann, had many children. Nine of which survived to adulthood. 6. He grew up as a neighbor of George Washington. 5. Was one of three who helped draft the US Constitution at the US Constitutional Convention in 1787. But was not happy with the amount of power the government had, and thought it needed edits. He said, “I would sooner chop off my right hand than put it to the Constitution as it now stands.” He stood his ground with 2 other dissenters, and never signed it. 4. Drafted the Virginia State Constitution. Other states used his draft to draft their state constitution. 3. Leader in Virginia during the Revolutionary War. 2. George was a driving force behind the Bill Of Rights, and died about a year after it was ratified. Point to ponder while you wander…. John 10:10 tells us that Jesus came to give life and life abundant. Sounds a lot like the right to pursue happiness. Doesn’t it? I’ve been having conversations lately about living vs existing with Jesus, my roommate, and several others. I need to fully LIVE this life and I haven’t been. John 10:10 is really on my heart…Jesus came to give us life…abundant life. But we need to choose to receive that gift and really life every day as an adventure. I was beginning to just sit in a rut of work and Netflix. (11. Seasons of Criminal Minds, Stranger Things, and the like) And that is NOT who I am. Not even a little bit. So this trip I am on is me returning to me. What trip? On Thursday I decided to go to a women’s conference in NYC. I flew out on Friday. And now I am in NYC for the weekend. Yesterday I started exploring a little bit and I started to feel alive again for the first time in a while. Maybe my rut came from me being in grief. Maybe from fear. Maybe from the weariness of waiting. I don’t know. But I stopped exploring and being spontaneous. I love exploring my Michigan and her cities.And I just stopped. I just sorta checked out. So if you’re in a rut too, get out and explore today. LIVE! Do something spontaneous. YES! Jesus died to reconcile and reconnect you to God. YES! Jesus died to take your sin and shame and for your healing, body, soul, and spirit. YES! Jesus died so you could be free from the weight of sin and death. BUT He also was RESURRECTED so you can LIVE AN ABUNDANT LIFE! And He sent Holy Spirit to EMPOWER you to be bold and courageous. So dooooooo it! Get out there. Go after what makes you feel alive. Point to ponder while you wander…your time on Earth is short…even at Moses’s 120 years…in comparison to eternity. So take some time and ask yourself what makes you feel alive? What really wakes up your soul and makes your spirit do flips in your belly? Then partner with Jesus and go doooooo it! You may not be living your dream life right this second…but that doesn’t mean you can’t fully live right where you are! ​Fear holds you captive. It enslaves you to live a smaller and/or lesser life than the full and abundant life God intended for you to live. Fear allows you to exist but not actually live. Fear paralyzes you. It invites you to hide and avoid risk, rather than believing God. “Even when there was no reason to hope, Abraham kept hoping- believing that he would become the father of many nations. For God had said to him, ‘That’s how many descendants you will have!’ And Abraham’s faith did not weaken, even though, at about 100 years of age, he figured his body was as good as dead-and so was Sarah’s womb. Point to ponder while you wander… You can choose to live abundantly in constant awe of your awesome God. In hope. In faith. In belief. You can choose to cower and let fear enslave you, paralyze you, and turn your abundant life into just blah ol’ existence. Jesus came to give us life. Not so that we could just exist or barely make it, but so that we would really live full and abundant lives!! In other words, life is for living!!! We are spirit. We have a soul (mind, will and emotions). And we live in an earthly body. That body will die. Because, here on earth, death is inevitable. But death here is not the end. We are spirit. Spirit doesn’t die like the body. So when we leave this world it’s not the end of life, but the beginning of eternity with Jesus. So live this first life fully, but there’s no reason to fear death. To leave here means we will be with our Savior, Jesus. I’m feeling random today. Prepare yourself. I guess it’s because I spent a day and a half cleaning my room. This means that my body was occupied but my mind was left to wander all over the place. My wandering mind can find shenanigans too easily. And yes, I actually spent a full day and a half cleaning my bedroom. A full day and a half! You see, when I get upset or have a lot of change I start piling things around my bed. I don’t even realize I’m doing it until one day I walk into my room and I can no longer see the floor. I call it “nesting.” I’m literally building a protective nest around my bed. It’s one of those unconscious things I do when I can’t deal with all the things. And I’ll be honest…I’m struggling to deal with all the things. Even though all the things are good. New place to live. Inexpensive. Great Roommates. I have the biggest room, mostly because I have the most stuff. Most of the stuff is books and art supplies, and a 5 foot stuffed alligator that a really dreamy friend won for me in England during a study abroad. Good times bringing that home on the airplane. New car. 2 years old but new to me with low miles. It’s the color of Yoda and gets like 35 miles to the gallon. I LOVE IT! New church. Well not exactly new, I’ve been there for conferences and to visit friends, but now it’s my church. The people are fabulous and the word is good. But for some reason I cannot settle in there. I don’t know why. It’s been a battle. God confirmed that it’s my church. I have peace about it. And yet I don’t want to go. So weird. 1. I’m struggling because after the past few years of reoccurring unemployment, having my car repossessed, having my house auctioned, and my credit sliding into the 500’s, I simply do not know how to not struggle. I keep waiting for my job to go away or some other trauma or drama to occur. God used these crappy years to show me His faithfulness and provision. He used this to show me that I don’t have to be afraid. In feast or famine He’s there. He never leaves. He didn’t cause my issues, but he used them to teach me and turn things around for my good. Despite learning all of this and coming out of it with a new perspective, I cannot settle into my new life. I think that’s part of the other reason my room was a disaster, I wasn’t unpacking or getting comfortable here because I was waiting for it to turn ugly with my roommates, or to be kicked out or something. I’m not a low expectations kind of gal. I’m a dreamer with a big imagination. If I don’t keep tabs on my thought life…I can be caught rehearsing my best original screenplay Oscar speech. Seriously. I’m so frustrated with myself about the expectation of calamity and drama. I know that we receive what we expect and believe. If I expend all my energy being afraid and worrying, I’m actually agreeing with the Enemy’s plan for my life. His plan is to steal from me, to kill my dreams and bring sickness my way, and to destroy my joy and peace. So what is my deal? Why am I building a security nest? Why am I sad? Am I not believing God? Do I doubt Him? Am I ungrateful? No. No. And no. I believe God will do all He said He would do. He just does it in His perfect timing (Which is not my timing, clearly.) I’m so thankful for my job and home and car and everything else that I’ve been blessed with. God is good to me! 2. My new life isn’t what I expected. Aw crap. There’s that expectation word again. I had a similar breakdown when I turned 25. My life isn’t what I expected and I’m not where I expected to be at 40, and I’m sad about it. Some of that has to do with me feeling like I’m failing and like I’ve missed opportunities. I feel like I’ve wasted so much time dealing with my issues that I’ve not been doing anything beneficial for the kingdom. I feel like a failure. I feel worthless. I know that these are lies. I know that I am valued by God. I know that I cannot fail unless I quit. I know that preparation time is not wasted time. But I’m still struggling with it. But I know Jesus is good. I know He doesn’t withhold good gifts. So why all the waiting? The first point of this passage is that Jesus loved Mary, Martha and Lazarus. And I know that Jesus loves me just as much. The second point of this passage is that when the situation looks absolutely hopeless from a human point of view, when there’s nothing more that can be done, that’s when miracles happen. That’s when God shows up and displays His glory for the world to see. Points to ponder while you wander… You are loved. It’s never too late. The bigger the problem the greater display of God’s glory. PS If you’re so inclined, read Lazarus’s story in John chapter 4. It’s an amazing story!